Researchers map epigenetic autism pathway during neurodevelopment. Scientists at the University of California have found that mutations that cause autism in children are connected to a pathway that regulates brain development. The researchers studied a set of well-known autism mutations called copy number variants or CNVs. They investigated when and where the genes were expressed during brain development. One surprising thing that the team immediately observed was that different CNVs seemed to be turned on in different developmental periods. The opensource study is published in the journal, Neuron. The team state that the proteins encoded by these genes form a complex that regulates the levels of a third protein, RhoA. Rho proteins play critical roles in neuronal migration and brain morphogenesis at early stages of brain development. Further experiments confirmed that CUL3 mutations disrupt interaction with KCTD13, suggesting that 16p11.2 CNV and CUL3 may act via the same RhoA pathway. RhoA levels influence head and body size in zebrafish, a model organism used by geneticists to investigate gene functions. Children with 16p11.2 CNV also have enlarged or decreased head sizes and suffer from obesity or are underweight. The team state that the model fits perfectly with what was observed in patients. Interestingly, the RhoA pathway has recently been implicated in a rare form of autism called Timothy syndrome, which is caused by the mutation in a completely different gene. The fact that three different types of mutations may act via the same pathway is remarkable, state the team who now hope to target it therapeutically. The team are planning to test RhoA pathway inhibitors using a stem cell model of autism. The team summise that if they can discover the precise mechanism this should lead to the development of targeted treatments. Spatiotemporal Protein-Protein Interaction Network Construction. 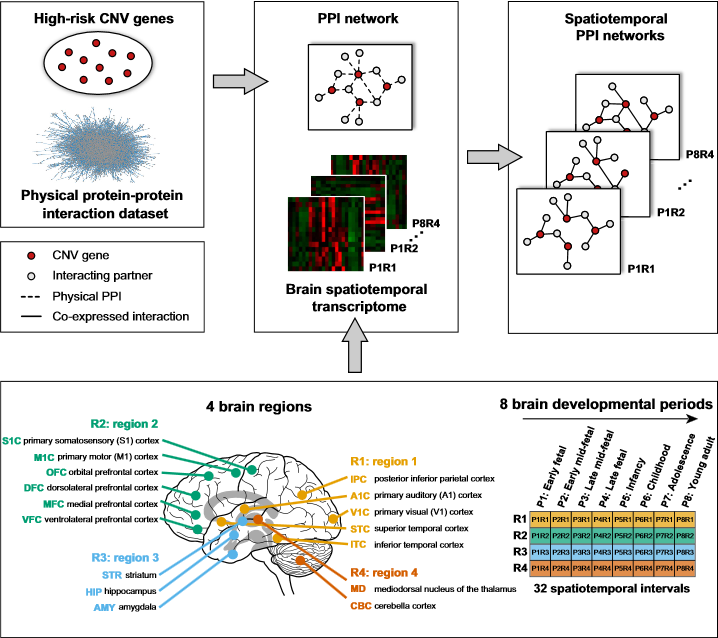 Spatiotemporal PPI networks were constructed by integrating physical protein-protein interaction data with the brain spatiotemporal transcriptome. The connections (solid black lines) between CNV proteins (red circles) and their interacting partners (gray circles) within the spatiotemporal PPI networks were drawn only when two proteins were co-expressed and interacting physically (dashed black lines). Four brain regions (R1, yellow; R2, green; R3, blue; R4, orange) and eight brain developmental periods (P1–P8) were integrated to build 32 spatiotemporal PPI networks for each CNV region. Spatiotemporal 16p11.2 Protein Network Implicates Cortical Late Mid-Fetal Brain Development and KCTD13-Cul3-RhoA Pathway in Psychiatric Diseases. Lakoucheva et al 2015.